So… looks like the rumours were right on the money! 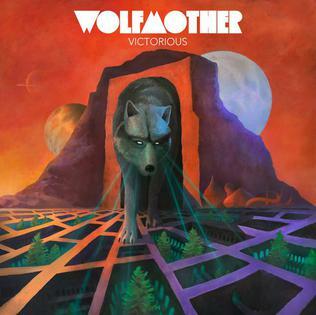 Wolfmother have confirmed that their fourth studio album will be entitled Victorious and will see release on 19th February 2016. The release looks to be supported by the band’s label Universal, contrary to the self-released New Crown of last year. The rumoured title Gypsy Caravan is actually the title of a new song, but the artwork was pretty much bang on so this could have been an earlier planned title for the album. Customers who pre-order Victorious on iTunes (currently only available on the US store, possibly more when you’re reading this!) will also receive downloads of the tracks ‘Victorious‘ (the album’s lead single) and ‘City Lights‘. Both tracks are also available on YouTube (click song titles). The full track listing can be seen below. The one note I personally would make is that the album seems short, clocking in at just over 35 minutes. However, quality over quantity and all that, so bring it on. The album is confirmed to feature frontman Andrew Stockdale on vocals, guitars and bass, with drums shared between Josh Freese and Joey Waronker. No word yet on whether Ian Peres and Vin Steele appear on the record, but they are not mentioned yet. Recording took place at Henson Studios in Hollywood, California with producer Brendan O’Brien. EDIT: Andrew has since confirmed that Ian Peres will in fact be on the album. He played all the keyboards on the album, with bass handled by Andrew as mentioned. Andrew stated in an interview with Loudwire that the recording of the keys “only took two days”. Also confirmed is a North American tour, which will start on 24th February in Minneapolis, Minnesota and run until 1st April in Vancouver, British Columbia. Full details can be found at this exclusive Billboard magazine interview with Andrew. I can’t believe Ian Peres is not involved- he’s a fantastic bassist and keyboardist. Need his talent in my opinion. The transititon and improvment from the demo of Love That You Give to the 15 seconds that was posted of the track on Faceboo/Instagram was exceptional. Can’t wait to hear that. Victoriuos and City Lights didn’t do anything for me. I feel the song-writting was below par. I might need to give it a few more listens. It seems the 70s vibe is fading a bit. Seems more modern- which in my opinion is a bad thing for the band. The tracks seem very short. In hard rock, blues rock and psychedelic rock, tracks seem to be much longer and in the past Wolfmother would have a few over 6 minutes. I’m a bit annoyed that Wedding isn’t on the record. It was recorded with Kadavar drummer Christoph ‘Tiger’ Bartelt- who is a very talented drummer and producer. Finally, it will be very interesting to see who plays live with Andrew Stockdale. It seems unlikely that it will be Peres and Steele though. If cloning existed, I’m sure Stockdale would make three of him and put him on bass and drums as well. Thanks for the long comment! It looks like Ian IS involved after all — I’m just adding an edit to the article to clarify this. He played keyboards only, no bass. Those other tracks, I doubt they’ll be released… although I could be wrong, maybe they’ll turn up on a deluxe edition or something in the future. As for the live lineup, I reckon it’ll be Andrew, Ian and Dave. That will be Andrew’s first choice. If Dave can’t make it, then I’m sure Vin will be involved, assuming he is not busy with other commitments. Yeah Andrew, Ian and Dave will be a great line-up. It’s weird to think that every album (5 inc KM) has a different line-up. Cosmic Egg was recorded and released within the space of multiple changes haha- yet it was the best one in my opinion. Victorious and City lights are ok tracks in my opinion, but they seem a bit too polished. Ian is a strong asset and it’s disappointing to see that he’s not being utilised as much. New Crown (although the recording quality could’ve been better) was definitely written out of jamming with vin and Ian and was so sick, but this just sounds like a self produced record by Andrew. I’ve been a loyal fan since the first record, so we’ll see what happens..
Victorious was an instant love affair for me but City Lights still needs some listens. Looking forward to the album but I’m a bit worried it might be too radio-friendly, too pop-sounding. The production seems a bit polished like Kieran said, and the longest track is actually Victorious, lol. I mean… some of WM’s most epic tunes are over 5min long: White Unicorn, WEHB, Colossal, In The Morning, Eyes Open, New Crown, Tall Ships, My Tangerine Dream. Here, the only song over 4min is Victorious! In New Crown, only three songs are under 4, two of which are probably the worst songs on the album. Only three songs in Cosmic Egg and Four on WM1, and now, it’s all over the album. Worries a guy that said he wanted an over-eight-minutes WM epic. But let’s see how it goes. from the description it looks like it is more of an andrew stockdale solo record than “keep moving” itself! keep moving even had other band members receiving writing credits and there are like 10 people playing on it. I was hoping for something like New Crown but mixed better and with better sound quality. When S.dale doesn’t over-produce his song-writing and when he doesn’t try to hard his stuff sounds really good. the 2 new tracks do sound like something from a solo record, not a band effort. Hey Andre, if you are reading this, please can you move on the new forum that you created a while back? We want to move on there because the chat box is unusable, but we need someone to keep an eye on it and ban some trolls in the case. New sections and some graphics improvement too, everybody can help if you don’t have time for that!